On November 11, Americans celebrate Veterans Day, which was once called Armistice Day. The date marks the end of World War I, fought by America in 1917 and 1918. It was a bloody, terrible war. Soldiers fought knee-deep in muddy trenches, were forced to live with rats and lice for months at a time, and were shot at night and day by machine gun and artillery fire. More Americans died in only five months of combat in World War I than were lost in ten years of fighting during the Vietnam War (1964–1973). If they were wounded in battle, chances were that they would never make it back alive. Behind the lines and back home a dreaded new disease—influenza—killed even more soldiers and civilians. Few people remember World War I today. After all, it was fought a long time ago, and only a few old soldiers are left alive to tell about their experiences. Sometimes we discover a uniform, helmet, gas mask, or photograph in an attic, in an old trunk, or in the back of a dark closet. When we meet a veteran or find a dusty artifact from the war, there are many questions we might ask. How did the war start? Why did America fight? What was it like to be in battle? What happened back home during the war? What was North Carolina’s role in the war? The war began in August 1914 after the murder of Archduke Francis Ferdinand, who was next in line to rule Austria-Hungary. A Serbian assassin shot to death the archduke and his wife in the streets of Sarajevo, and Austria-Hungary immediately declared war on Serbia. Soon the Allies—including the British Empire, France, Italy, Russia, and Romania were at war with the Central Powers—Germany, Austria-Hungary, Turkey, and Bulgaria. The war was fought in France, Belgium, Russia, Italy, the Balkans, the Middle East, and Africa. German armies invaded Belgium and France and almost won the war in the summer of 1914, but their luck ran out. Eventually the opposing armies fought to a standstill in France on what came to be called the western front. Both armies dug trenches opposite each other and continued fighting. Thousands and thousands of soldiers were killed on both sides in the next three years, but nobody could win. At first the United States stayed out of the war. The American people believed a European war was none of their business. President Woodrow Wilson agreed and kept America out of the conflict from 1914 to 1917. Then the Germans sank several ships and United States citizens were among those killed. America declared war in April 1917 when Germany threatened to sink more ships. The United States was unprepared to fight a war in Europe. The army was small and short of men, weapons, and equipment. President Wilson called up a draft to increase the size of the army. Training camps were set up throughout the country, but there were not enough rifles, uniforms, or artillery. Soldiers had to practice with sticks for rifles and pine logs for cannon. It took almost a year before America had any troops ready to fight. In the meantime, Germany had defeated Russia and was about to defeat British and French armies on the western front. Then the Americans arrived. The state sent 86,457 soldiers overseas to fight for the United States. In only five months of combat, 624 North Carolinians were killed in battle while 3,655 were wounded and 204 later died of wounds. In addition to the battle casualties, another 1,542 North Carolinians died of disease while serving in the army, mostly from influenza. Even more died of influenza back home. These people, and many more, served their state and country during the hard years of war. You will hear stories of people from our state—from first volunteers, soldiers in the trenches, and nurses behind the lines to people on the home front. The political leadership, terrible weapons of war, medical treatment, and how the war ended will be described. World War I, once called the Great War, is an important chapter in American history and of North Carolina's history. At the time, Americans thought it would be the “war to end all wars.” But it was not. At the time of this article’s publication, R. Jackson Marshall III served as chief curator of the North Carolina Museum of History. Marshall, author of Memories of World War I: North Carolina Doughboys on the Western Front (Raleigh: Division of Archives and History, 1998), became keenly interested in World War I while talking to his grandfather, who fought in and was wounded during the war. Sarah McCulloh Lemmon, North Carolina's Role in the First World War (1975). George C. Lewis and John Mewha, History of Prisoner of War Utilization by the United States Army, 1776-1945 (1955). Jacqueline Burgin Painter, The German Invasion of Western North Carolina: A Pictorial History (1992). North Carolina in the Great War (WWI) (website), North Carolina Department of Natural and Cultural Resources. Includes historical information and links to online exhibits and historical documents and images available online. https://www.ncdcr.gov/education/topics/world-war-i (accessed August 29, 2016). North Carolinians and the Great War: The Impact of World War I on the Tar Heel State Introduction to The Home Front by Dr. Michael Sistrom, Documenting the American South, UNC-Chapel Hill: http://docsouth.unc.edu/wwi/homeintro.html. "WWI: The Old North State and 'Kaiser Bill.'" State Archives of North Carolina.N.C. Department of Cultural Resources. 2005. http://www.history.ncdcr.gov/SHRAB/ar/exhibits/wwi/OldNorthState/index.htm (accessed September 25, 2013). United States Army, Signal Corps. 1918. "Col. J. 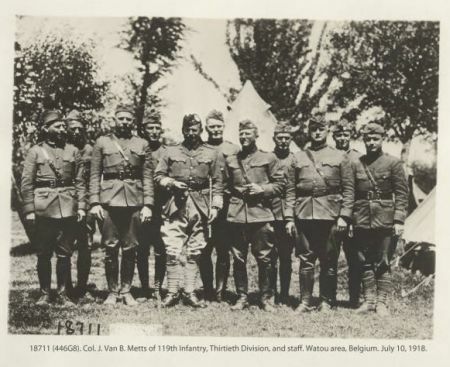 Van B. Metts of 119th Infantry, Thirtieth Division, and staff, Belgium, July 10, 1918." State Archives of North Carolina. Military Collection, World War I Papers, XII. Photographs and Postcards, Box 1. Online at http://digital.ncdcr.gov/u?/p15012coll10,1701. I would like any information on my grandfather who fought in WW1 he was from Avery County, NC at one time Avery county was part of yancey county. Thanks for any information. His name was Coleman Issac Burleson.